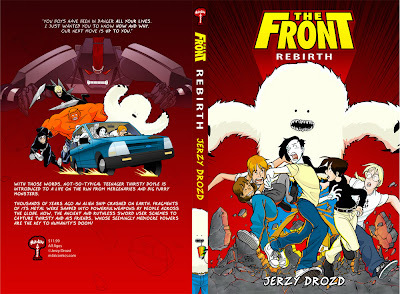 So a while back I ran a sale on my graphic novel, The Front: Rebirth. I've since talked about the results on Art & Story, and a little bit here, but to recap: sales weren't quite as awesome as they could have been. Of course the proper response is to ask why that is and try to correct it. 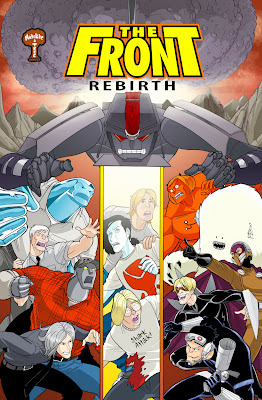 One of the main things working against me, according to my art buddy Mark Rudolph and my wife Anne, is that the current cover is just too darned busy. I do love this cover, but I can see their point. There's not much to really focus on, no one thing that jumps out at you and explains succinctly what the tone of the story is. I also suspect that part of it has to do with price point. I think $15 is past a lot of people's threshold for an entertainment purchase. There are other reasons as well, like market penetration and insufficient promotion, but I won't go into too much of that just now. Mark convinced me to use some art I had previously used for a free desktop image on the website--his assertion was that it has much more focus, the conflict and tone are more clearly spelled out, and he always liked the way I draw debris. Couldn't argue with him on any of those points. This edition also features fewer pages--no extra features like in the original printing, just the story itself. I'm printing it in a smaller size, one that I've come to love, which is approximately 5.8" wide by 9" deep. A lot of the graphic novels coming out from publishers like Scholastic, Hyperion, and First Second are done in this size, and I find them much easier to hold and flip through than the larger American comics size (7.5" by 10.5"). There's something much more friendly about this smaller size that I can't put my finger on. Maybe it's something as simple as distancing itself from mainstream American comics, maybe the smaller size implies that it's less about the art than it is about the story, I don't know. But I really like it. These changes also mean a lower unit cost, which means I can afford to charge less. So this next edition of The Front will be $11.99 instead of $15. We'll see how it goes when I get the new edition up for sale, and when I take some copies to conventions in the coming months. I'm feeling a bit more optimistic about this new design and format.